The Intrix Traffic Scorecard from 2015 shows that a Belgian driver is stuck in traffic on average 44 hours a year. In the top ten of European cities with the most severe traffic congestions, Antwerp is third. One of the main reasons for the structural congestions in Antwerp is the insufficient capacity of the ring road R1. At present that road is not completely closed lacking a part in the north-west. The Antwerp port and airport are important logistics and economic hubs of Europe. Undeniably, the traffic jams and structural congestions lead to economic losses. Hence, smooth mobility in and around Antwerp is of vital importance. Due to the diversity of road users (transit and urban traffic, freight and passenger transport, etc.) in combination with its layout, the R1 is confronted with structural safety issues. In addition, the quality of life and road safety of the approximately 850 000 inhabitants of the Antwerp region must be considered. The left bank project: Renovated and redesigned junctions connect the Oosterweel route via the Scheldt tunnel to the E34 to Knokke, the E17 to Ghent and the Kennedy tunnel. The Charles de Costerlaan will be a bicycle and pedestrian boulevard. This way the Waasland Tunnel will regain its local function. The Scheldt tunnel project: On the left bank the Scheldt tunnel dives underground between the nature conservation areas Blokkersdijk and the Sint Annabos. At Noordkasteel it resurfaces. The tunnel will be 1.8 kilometers long, have three lanes in each direction and a separate tube for cyclists and pedestrians. The Oosterweel junction: The Oosterweel junction provides access to the port of Antwerp and the northern part of the city. This intersection is of prime importance for the port to keep freight transport away from the city. The Canal tunnels: The Canal tunnels will be dual-layered, cut and cover tunnels consisting of 4 tubes, stacked two-by-two. This construction starts at the Amerika dock and passes under the Albert canal. At the east of the Noorderlaan it splits into 2 separate tunnels which connect to the existing ring road R1. R1 –Noord: The Merksem viaduct will be taken down. The R1 will be embedded in an open cut tunnel and in a tunnel under the Albert Canal. A new junction will be built in Deurne to allow smooth traffic flow coming from the Ring and the E313 to the Bisschoppenhoflaan and the Noordersingel, and vice versa. As a result, shortcut and freight traffic will be reduced in Deurne-Noord and Merksem. With the construction of a temporary park en ride zone on the left bank the first steps of many are taken to create the Oosterweel link. 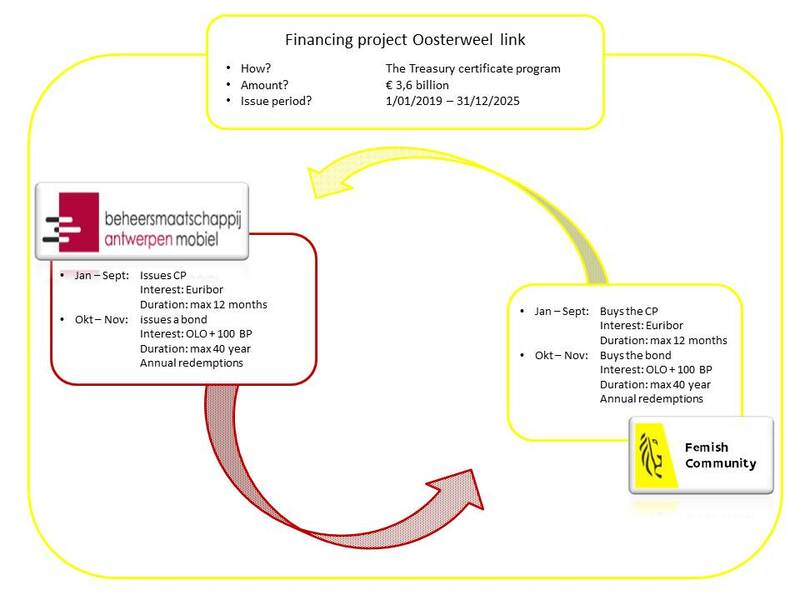 The management company Antwerpen Mobiel nv (Bam nv) is responsible for the financing, realization, management and exploitation of the entire project. For more information about the Oosterweel link: http://www.bamnv.be/ and https://www.oosterweelverbinding.be/. 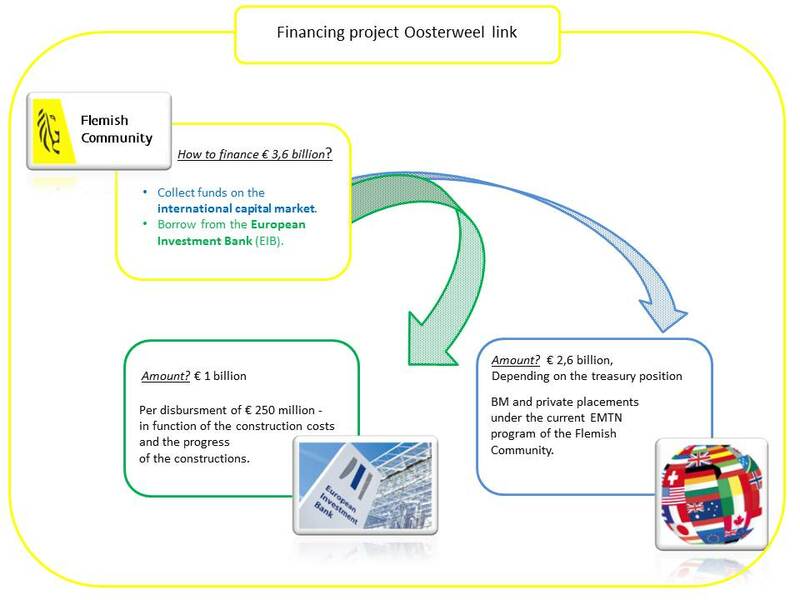 For the realization of the Oosterweel link and the related activities and works, BAM needs financing that the Flemish Community is prepared to provide. The structure and modalities at which this financing will take place are regulated in a framework agreement between BAM on the one hand and the Flemish Community on the other. This agreement provides for the draw up of a treasury certificate program of EUR 3 600 000 000 with a financial institution. This treasury certificate program is a combination of short-term financing through the issue of Commercial paper and long-term financing through the issuance of bonds. Every year, short-term Commercial papers absorb the financing requirement for the first nine months of the year. These Commercial papers are issued for a term between 1 and 12 months. The interest will be equal to the EURIBOR with the same duration as the Commercial paper issue without margin. Subsequently, a bond issue covers the financing needs of the last three months of that year and ensures the full repayment of the outstanding Commercial papers. The interest rate of the bond will be equal to the OLO increased with a margin of 100 bps. For issuances with a term of less than 30 years the corresponding OLO with the same duration as the issue will be taken. For issues with a term of 30 years or longer the OLO 30 will be taken. The interest is payable annually. For each bond there will be annual capital repayments, with the first repayment on the annual renewal date of the first calendar year of the operational period. The outstanding balance may not exceed EUR 3 600 000 000 at any time. The Flemish Community commits to fully subscribe the debt certificates issued by BAM nv. BAM nv will in return only use the amount of the funding for the financing of the realization of the Oosterweel link and related activities. Issuances and withdrawals on the program are possible until the end of the construction period of the entire Oosterweel link. According to the current estimations the construction period is foreseen from 2018 until 2025. The reimbursement starts at the same moment as the toll collection by BAM nv starts. The maximum reimbursement period has been set at 35 years. Together with the construction phase this gives a maximum term for the bonds of 40 years. Depending on its treasury position, the Flemish Community will also have to borrow the 3.6 billion euros. This will be done on the one hand by raising funds through the EMTN program on the international capital market and on the other hand by borrowing from the European Investment Bank (EIB). The EIB recently granted a loan of 1 billion euros to the Flemish government for the Oosterweel link. The loan will be provided in disbursements of 250 million euros in function of the progress of the constructions and in function of the construction costs. The amount borrowed from the EIB may not exceed 50% of the building cost. The scheme bellow shows the different financial flows. For more information about the European Investment bank: http://www.eib.org/.